This was the weakest spatial point in the Water God’s world, and was also the source of the Mist Tide that people feared. The monsters from the Mist Tide were living on this island. They moved along the Mist Tide and hunted the creatures who were carelessly involved into the mist. When the Mist Tide faded away, they would return to the Island of Mist themselves. The people in this world didn’t understand the principle behind it, neither the Dark Shadow Spider Queen, but she didn’t mind it. She only took this place as the Sky Sword’s landing place and the nest of her Phase Spiders. After the first Golden Slime Queen was born, she ordered all special slimes to go to this island once they were born. As a result, slimes had almost occupied half of the space on the island. The people who hadn’t seen Shaya Longnis, the Sky Sword could never imagine how strong her true power was. This world’s moving disaster, the brutal monsters in the Mist Tide, had almost all been killed off by these slimes. Those special monsters who had once driven the young boys up the wall had all become the slimes’ food. Apart from the central area, where the strongest bone dragon inhabited, the Island of Mist had become the base camp of the Sky Sword. When Yun Xi and Yun Que went to this place, it was like two sheep went into a tiger’s mouth. In the wilds, on the Island of Mist, a cruel battle had entered it’s hottest stage. One Red Lotus Arrow after another exploded amongst the slimes, clearing a wide area in the range of dozens of metres. But soon, more and more slimes had gushed out from the mist and filled the vacancy again. These slimes could be regarded as the Slime Army’s hero units. They were not harmless low-grade monsters anymore. Instead, they all had special abilities. Poison Slime could spit venom. Ice Slime was protected by a halo of ice. Giant Slime bodies were already a heavy weapon. Lava Slime body temperature was so high that it could even melt the ground, not to mention that they could detonate themselves! If they weren’t facing the Mist Soul Army, but any other army, these slimes would already have won this battle. In a way, the Mist Soul Army was the only force in this world that could defeat the Slime Army. No matter how many slimes they would face, these Mist Souls would strike back with no mercy. No flame, ice blast and explosion could do harm to them, so they could fight their way through the slime crowd easily. The slimes all dropped cores on the ground after they were killed by the Mist Souls. Yun Xi controlled the mist to take the cores back and let the green slime bracelet on his arm absorb them. This was already the third area of the Island of Mist. On the first two areas, Yun Xi and Yun Que had killed over a hundred thousand slimes and cleared out dozens of slime nests. However, this was just the beginning. As if they just opened a box that should never be opened, more and more slimes rushed to them from the mist with no signs of stopping. If it wasn’t Yun Xi’s Mist Soul Army, but the three High Priestesses, they would have been overwhelmed by the endless slimes by now. “I didn’t expect that it’d be so tiring!” Yun Que breathing hard put down the bow and adjusted her breath. Her hands were limp and painful at this moment. She needed to take a rest. How many slimes have Yun Hai and I killed? Probably the number is already over half a million. If converted their weight to human’s body weight, the number should be over a million! However, even after killing so many slimes, there are still more and more slimes gushing out of the mist. How many slimes are in the mist? How can it be possible? They shouldn’t have obtained sufficient nutrients to proliferate! “You don’t need to push yourself.” Compared to Yun Que, Yun Xi was more leisurely. “No. Letting down of my guard will mean that I’m close to death.” Yun Que shook her head. “We are on the battlefield. Anything is possible and can happen on the battlefield. 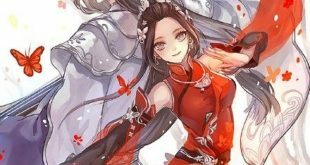 Maybe a strong monster will come and reverse the war situation…” Before Yun Que finished her words, she suddenly noticed that Yun Xi’s body shook, with an emotion called “fear” in his eyes. “You… are right. She… is coming…” Yun Xi’s voice sounded nervous. For the first time, he looked really worried in front of Yun Que. “She? Who is she?” Yun Que’s instinct was as strong as Yun Xi’s. She hadn’t noticed that the “monster” was approaching. “I knew I would see her sooner or later, but… oh, as expected, she is in the Sky Sword’s camp…” Yun Xi took a deep breath, gazing at the sky. “It’s her!” After a little while, Yun Que also noticed the small black point in the sky. Her pupils contracted. She would never forget this figure. She was defeated by this girl’s sword, so she had to experience that “nightmare” again. Stepping on one translucent halo after another in the air, one of the strongest trump cards, Yun Xi’s childhood sweetheart, was rushing to them from the sky. A strand of hair was rotating on her head, as if it was a small detecting device that was being disturbed. With a violent rage, Yun Xi’s first love, Hua Huo, was rushing to them from the Sky Sword’s camp!